Advaning C Series awnings are professionally designed to deliver user-friendly features and superior quality. 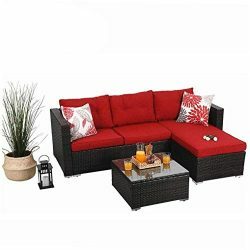 You and your family can enjoy great comfort outdoors at an affordable price. 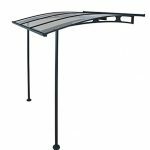 The slope of your canopy may need to be adjusted depending on the time of day and the process should be swift and simple. Other brands offer an adjustable pitch in a more complicated multi-step process that may involve the use of other tools. However, with Advaning’s Easy Pitch System you simply hook up the hand crank through the Easy Pitch loop and rotate the loop to raise or lower the front pitch bar to your preferred shade coverage (No additional tools needed), unlike other brands. 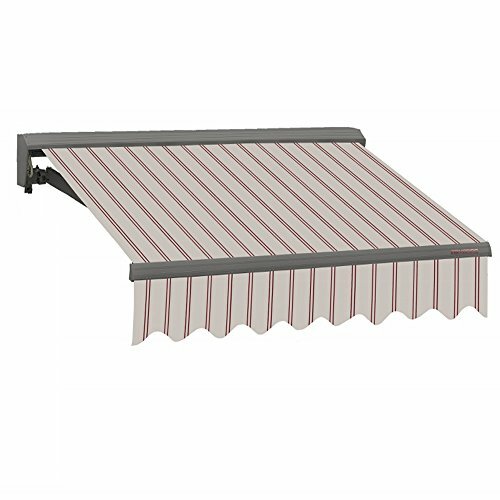 Advaning’s acrylic fabric is fade resistant and durable compared to other awning fabrics like polyster. The fabric is highly breathable keeping your home cool and energy efficient all year long. Great for areas with high humidity and sunlight. Classic heavy duty 183x47mm high quality aluminum 6063-T5 cassette hood over for fabric and motor protection. 1. Freight shipment with signature confirmation required upon delivery. 2. PLEASE NOTE: Delivery may require a direct contact phone number. Please ensure all shipping and contact information is up to date upon placing an order via Amazon.com. 퐂퐎퐋퐎퐑 퐀퐍퐃 퐒퐈퐙퐄: 16′ x 10′. Color: Natural Beige with Brick Red Stripes. Gray Frame. 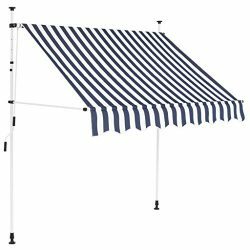 Advaning Awnings are 100% Fully Pre-Assembled and Ready for Installation. 퐄퐀퐒퐘 퐏퐈퐓퐂퐇 퐒퐘퐒퐓퐄퐌 The 3-Loop System Includes Two Easy Pitch Loops and One Crank Loop. 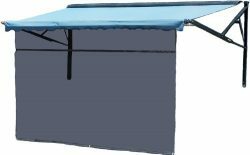 Using the Two Easy Pitch Loops, the Awning’s Pitch can be Adjusted to Block the Sun at Different Times of the Day. 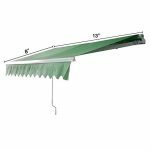 Using the Crank Loop, the Awning can be Manually Opened and Closed. 퐏퐑퐄퐌퐈퐔퐌 퐅퐀퐁퐑퐈퐂 Advaning’s Premium-Grade 100% Acrylic Fabric Provides UV80+ Sun Protection. 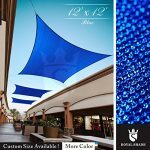 It is Fade and Mildew Resistant, and has a Highly Breathable Quality that doesn’t Trap Hot Air or Moisture, which is an Advantage over Polyester and Vinyl Fabric. 퐃퐔퐑퐀퐁퐋퐄 퐃퐄퐒퐈퐆퐍 Built with a Durable 40x40mm Steel Frame and a 70mm Diameter Aluminum Roller Tube for a Stronger and Safer Structure. The Stainless Steel Hardware has Excellent Corrosion Resistance and Strength. 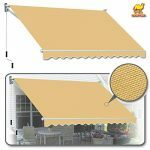 퐖퐀퐑퐑퐀퐍퐓퐘 5-Year, Manufacture Warranty by Advaning Awnings and Lifetime Tech Support by US based Email, Web Chat, or Phone by Advaning’s Professional Service Team.